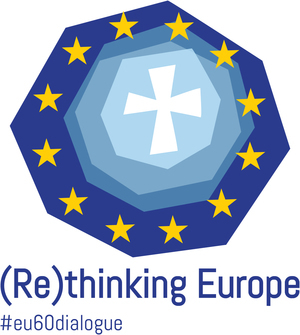 I am pleased to join you at the conclusion of your Dialogue on the theme (Re)Thinking Europe – a Christian Contribution to the Future of the European Project, sponsored by the Commission of the Bishops’ Conferences of the European Community (COMECE). In a particular way I greet the President of the Commission, His Eminence Cardinal Reinhard Marx, and the Honourable Antonio Tajani, President of the European Parliament, and I thank them for their kind words. To each of you I express my deep appreciation for your active contribution to this important discussion. Thank you! In these days, your Dialogue has allowed for wide-ranging reflection on the future of Europe from a variety of viewpoints, thanks to the presence of leading figures from the ecclesial, political and academic sectors, and from civil society as a whole. The young have been able to present their expectations and hopes, and to share them with their elders, while these in turn have drawn on their own reflections and experiences. It is significant that this meeting was intended above all to be a dialogue, pursued in a spirit of openness and freedom, for the sake of mutual enrichment. It has sought to shed light on the future path of Europe, the road that all of us are called to travel in surmounting present crises and facing challenges yet to come. To speak of a Christian contribution to the future of the continent means, before all else, to consider our task, as Christians today, in these lands which have been so richly shaped by the faith down the centuries. What is our responsibility at a time when the face of Europe is increasingly distinguished by a plurality of cultures and religions, while for many people Christianity is regarded as a thing of the past, both alien and irrelevant? In the twilight of the ancient world, as the glories of Rome fell into the ruins that still amaze us, and new peoples flooded across the borders of the Empire, one young man echoed anew the words of the Psalmist: “Who is the man that longs for life and desires to see good days?” By asking this question in the Prologue of his Rule, Saint Benedict pointed the people of his time, and ours as well, to a view of man radically different from that of classical Greco-Roman culture, and even more from the violent outlook typical of the invading barbarians. Man is no longer simply a civis, a citizen endowed with privileges to be enjoyed at leisure; no longer a miles, a soldier serving the powers of the time; and above all, no longer a servus, a commodity bereft of freedom and destined solely for hard labour. Saint Benedict was not concerned about social status, riches or power. He appealed to the nature common to every human being, who, whatever his or her condition, longs for life and desires to see good days. For Benedict, the important thing was not functions but persons, not adjectives but nouns rather. This was one of the foundational values brought by Christianity: the sense of the person created in the image of God. This principle led to the building of the monasteries, which in time would become the cradle of the human, cultural, religious and economic rebirth of the continent. The first and perhaps the greatest contribution that Christians can make to today’s Europe is to remind her that she is not a mass of statistics or institutions, but is made up of people. Sadly, we see how frequently issues get reduced to discussions about numbers. There are no citizens, only votes. There are no migrants, only quotas. There are no workers, only economic markers. There are no poor, only thresholds of poverty. The concrete reality of the human person is thus reduced to an abstract – and thus more comfortable and reassuring – principle. The reason for this is clear: people have faces; they force us to assume a responsibility that is real, personal and effective. Statistics, however useful and important, are about arguments; they are soulless. They offer an alibi for not getting involved, because they never touch us in the flesh. INVESTIR DANS L'EDUCATION ! 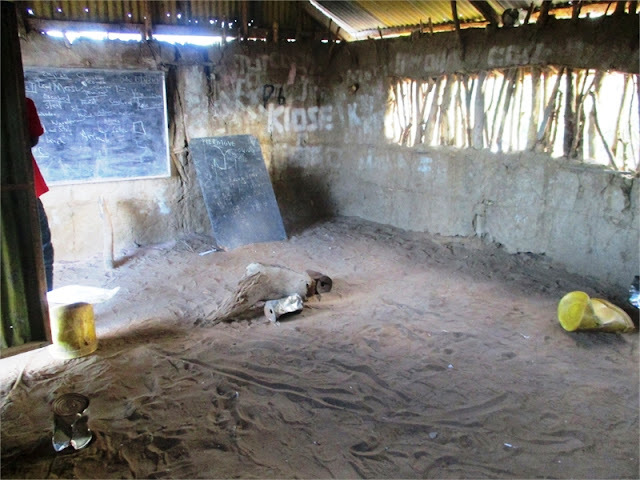 MILLIONS D'ENFANTS PRIVES D'ECOLE ! Pour Alice Albright, directrice du Partenariat mondial pour l’éducation, la création d’un fonds mondial pour l’éducation s’inspirant de ceux existant pour lutter contre les pandémies est nécessaire. Plus de 260 millions d’enfants et d’adolescents ne sont pas scolarisés dans le monde et 93 millions d’entre eux vivent en Afrique subsaharienne, selon les chiffres des Nations unies. L’éducation n’est pourtant plus une priorité de l’aide internationale, dont la part consacrée à ce secteur, environ 16 milliards de dollars (13,5 milliards d’euros) par an, stagne depuis 2010. Elle recule même dans les pays les plus pauvres. En 2016, le rapport sur le financement de l’éducation dans le monde confié à l’ancien ministre britannique Gordon Brown, puis, il y a quelques semaines, le rapport annuel de la Banque mondiale sur le développement, pour la première fois consacré à l’éducation, ont mesuré les risques de voir une partie non négligeable des futures générations privée d’accès à l’école. La directrice générale du Partenariat mondial pour l’éducation (PME), Alice Albright, appelle à une « réponse urgente et massive », à la mesure des initiatives prises au début des années 2000 pour faire face aux grandes pandémies. Selon elle, le Fonds mondial de lutte contre le sida, la tuberculose et le paludisme ou l’Alliance mondiale pour les vaccins et la vaccination (GAVI), dont elle a été la directrice financière de 2001 à 2009, sont des exemples dont il faut s’inspirer pour s’attaquer à « la crise de l’éducation ». When the sky above la Manche is clear, the UK coast can be spotted from the northern coast of France. Thirty-four kilometres separate the white cliff of Dungeness from continental Europe; a distance that after the vote on Brexit, weighs like a rock in the thoughts of those who believe in the European dream. However, a referendum vote does not erase the historical and cultural link between the UK and the continent. If London has decided to leave the EU, it does not leave Europe. Put another way, geography cannot be erased by a referendum vote. This is not simply rhetorical. Even after a Brexit, people will remain European on both sides of the Channel. They will continue to be sons and daughters of principles that have fought against particular interests, hate and blind ideologies that have overshadowed Europe for centuries. In the UK, as in any other European country, from the largest metropolis to the most rural village, people will continue to desire peace and democracy, pluralism and equality, rule of law and human rights; and the image they will have in mind will be the yellow stars on the blue background of the European Union flag. Weakened by Brexit and a general Euroscepticism, the European project remains the only peace guarantee for the continent. That is why it is necessary to nourish and renew it with individual and collective efforts to put the dignity of the human person and the common good at the centre of European policies. 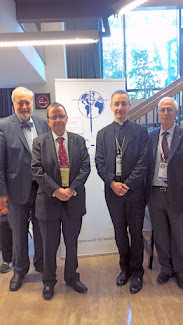 The European Church and its bishops, key players in European society, are committed to this effort and intend to make their contribution - a Christian contribution based on the Church's Social Doctrine - to the future of the European project. 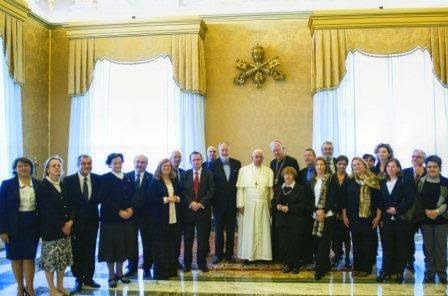 In this context, one of the main initiatives is the organization of (Re)thinking Europe, an international and multidisciplinary forum of dialogue between Church and political leaders that will take place in the Vatican from 27 to 29 October. Marking the 60th anniversary of the signing of the Treaties of Rome, which first embodied the idea of ​​the European Union, (Re)thinking Europe is organized in the form of a dialogue, thus emphasizing a free and respectful exchange of ideas, different experiences and opinions. 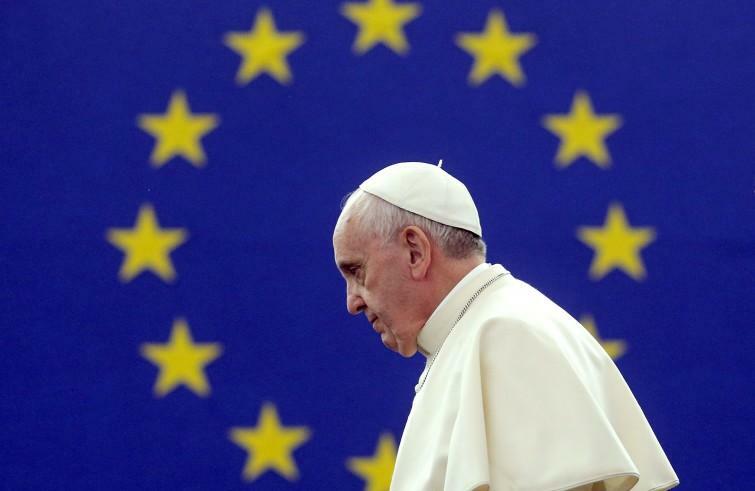 Instead of a congressional approach or division of roles, (Re)thinking Europe will consist of a discussion between men and women, political actors and representatives of the Church. Indeed dialogue will be the tool to (re)think Europe, the European Union - the peace project for the continent. (Office international de l’Enseignement Catholique). Un nouveau bureau à Rome. Le secrétaire général de l’OIEC , M. Philippe Richard à accueilli les participants à la cérémonie inaugurale des nouveaux locaux (situé in Via Aurélia, dans les bâtiments de la Congrégation des Frères Christians) : S.E. 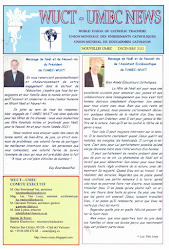 le Secrétaire de la Congrégation Catholique, Mgr. 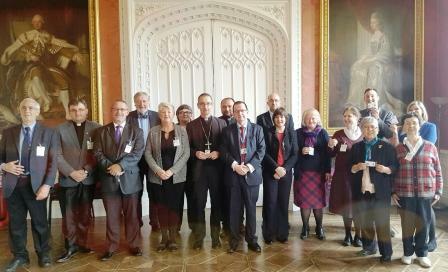 Vincenzo Zani, et des représentants des écoles catholiques dans diverses régions du monde et des associations catholiques. 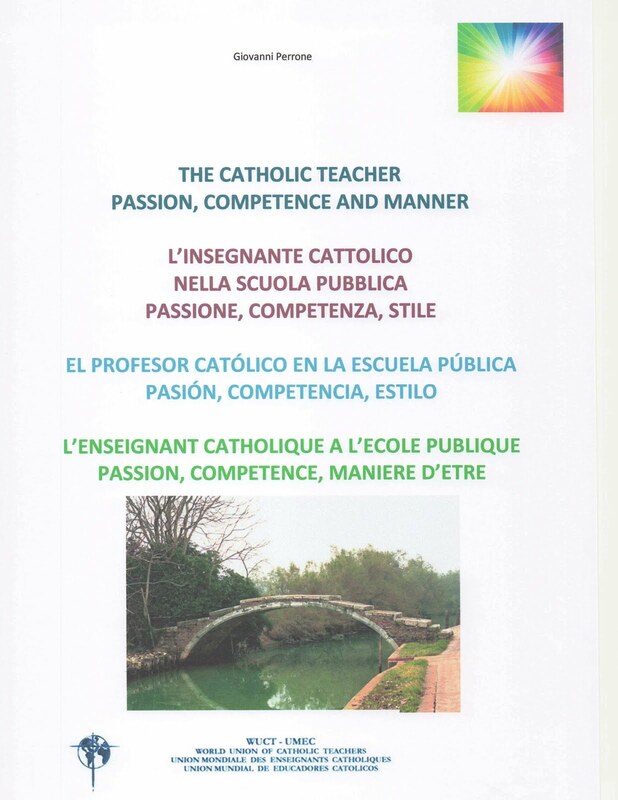 Mgr Zani a mis en évidence le grand travail que les écoles catholiques jouent dans le monde et son rôle en tant que lieu de rencontre et l’OIEC comme « atelier pédagogique » pour assurer aux écoles catholiques de haute qualité. 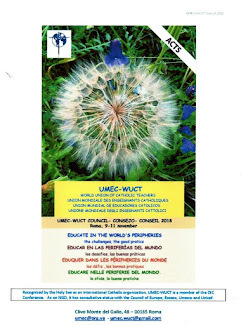 L'UMEC-WUCT était représentée par le Secrétaire général qui a souhaité « bonne route » à nom du Comité exécutif de l'Union. 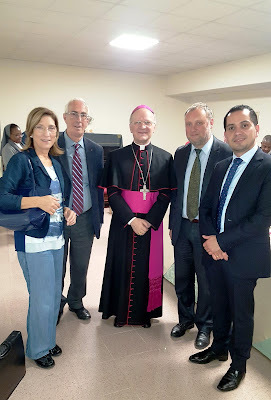 Sur la photo: Mme Rosa Musto, représentante du Ministère italien de l'Éducation, M. Giovanni Perrone, secrétaire général de l'UMEC-WUCT, Mgr. 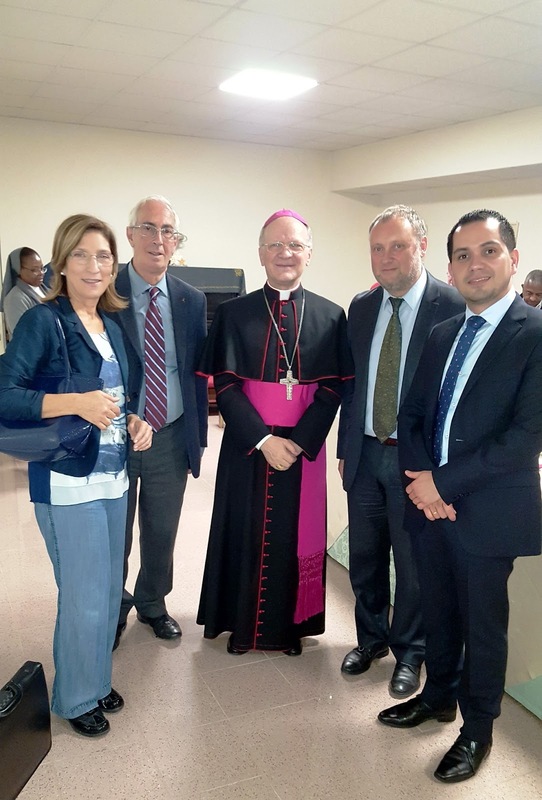 Vincenzo Zani, secrétaire de la Congrégation pour l'éducation catholique, M. Philippe Richard, secrétaire général de l'OIEC, M. Oscar Perez Sayago, secrétaire général de la Confédération Interaméricaine de l’Education Catholique (CIEC). FAO: Pope Francis urges action on climate change and conflict to address migration - " Introducir en el lenguaje de la cooperación internacional la categoría del amor"
Papa Francisco" ... me hago a mí mismo, y también a vosotros, una pregunta: ¿Sería exagerado introducir en el lenguaje de la cooperación internacional la categoría del amor, conjugada como gratuidad, igualdad de trato, solidaridad, cultura del don, fraternidad, misericordia? Estas palabras expresan, efectivamente, el contenido práctico del término «humanitario», tan usado en la actividad internacional. Amar a los hermanos, tomando la iniciativa, sin esperar a ser correspondidos, es el principio evangélico que encuentra también expresión en muchas culturas y religiones, convirtiéndose en principio de humanidad en el lenguaje de las relaciones internacionales. Es menester que la diplomacia y las instituciones multilaterales alimenten y organicen esta capacidad de amar, porque es la vía maestra que garantiza, no sólo la seguridad alimentaria, sino la seguridad humana en su aspecto global. No podemos actuar sólo si los demás lo hacen, ni limitarnos a tener piedad, porque la piedad se limita a las ayudas de emergencia, mientras que el amor inspira la justicia y es esencial para llevar a cabo un orden social justo entre realidades distintas que aspiran al encuentro recíproco. Amar significa contribuir a que cada país aumente la producción y llegue a una autosuficiencia alimentaria. Amar se traduce en pensar en nuevos modelos de desarrollo y de consumo, y en adoptar políticas que no empeoren la situación de las poblaciones menos avanzadas o su dependencia externa. Amar significa no seguir dividiendo a la familia humana entre los que gozan de lo superfluo y los que carecen de lo necesario.... "
"....... mi pongo – e vi pongo – questa domanda: è troppo pensare di introdurre nel linguaggio della cooperazione internazionale la categoria dell’amore, declinata come gratuità, parità nel trattare, solidarietà, cultura del dono, fraternità, misericordia? In effetti, queste parole esprimono il contenuto pratico del termine “umanitario”, tanto in uso nell’attività internazionale. Amare i fratelli e farlo per primi, senza attendere di essere corrisposto: è questo un principio evangelico che trova riscontro in tante culture e religioni e diventa principio di umanità nel linguaggio delle relazioni internazionali. 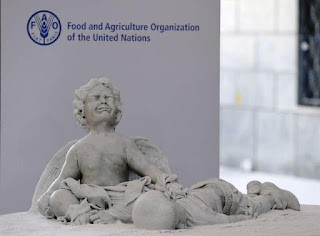 E’ auspicabile che la diplomazia e le Istituzioni multilaterali alimentino e organizzino questa capacità di amare, perché è la via maestra che garantisce non solo la sicurezza alimentare, ma la sicurezza umana nella sua globalità. Non possiamo operare solo se lo fanno gli altri, né limitarci ad avere pietà, perché la pietà si ferma agli aiuti di emergenza, mentre l’amore ispira la giustizia ed è essenziale per realizzare un giusto ordine sociale tra realtà diverse che vogliono correre il rischio dell’incontro reciproco. Amare vuol dire contribuire affinché ogni Paese aumenti la produzione e giunga all’autosufficienza alimentare. Amare si traduce nel pensare nuovi modelli di sviluppo e di consumo, e nell’adottare politiche che non aggravino la situazione delle popolazioni meno avanzate o la loro dipendenza esterna. Amare significa non .continuare a dividere la famiglia umana tra chi ha il superfluo e chi manca del necessario. 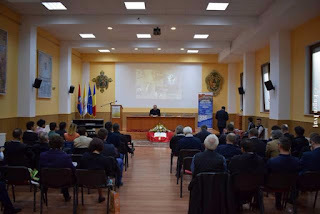 ..... "
Romania - XII INTERNATIONAL SYMPOSIUM "TRANSYLVANIAN SCHOOL"
The XIIth International Symposium "Transylvanian School" took place this month at the Faculty of Greek-Catholic Theology in Oradea. The event happened from 11th to 14th of October in the town situated on Crişul Repede River and brought together guests from Romania and Europe. This year's theme was centered on the seminary anniversary, which in 2017 celebrates 225 years of existence. Cardinal Francesco Coccopalmerio, President of the Pontifical Council for Legislative Texts, deliveded the opening speech on law and the person in the majestic Aula of the City Hall. The audience was made up several representatives teachers and students of the Greek-Catholic High School of Oradea. Along with them, there was the Greek Catholic bishop of Oradea, His Excellency Mgr. Virgil Bercea. 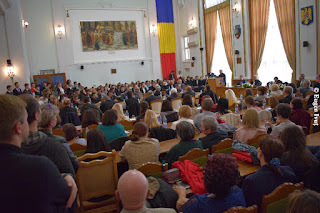 In the following days, the conferences were organized at the Oradea Seminar. 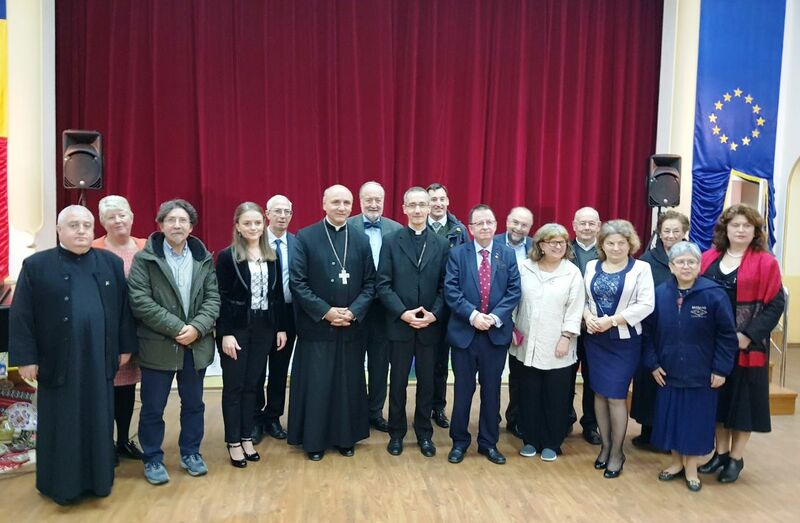 Here the lecturers and researchers from Italy, Poland, Spain, Slovakia, Ukraine, Hungary and Romania spoke on various themes of Church theology or history. Everything happened in the larger context of Transylvanian School, a movement of extraordinary importance for the history of the Romanians. 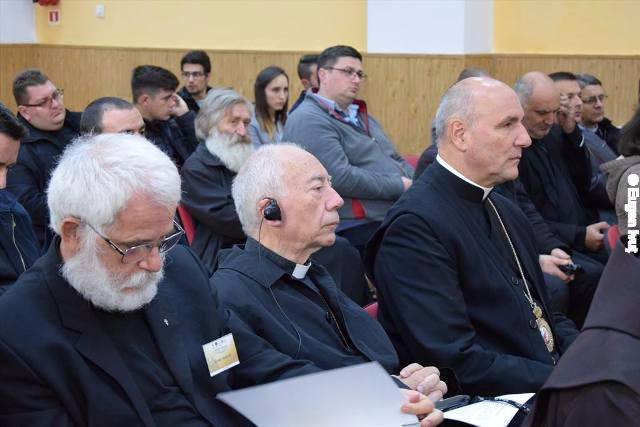 "I am very pleased that this symposium opens in Oradea, said Bishop Virgil, a high intellectual and spiritual meeting for our teachers and students". During the work, several books were launched. Among them is the book by signed Father Cristian Sabau on the search for the historical Jesus, an elaborate study that begins with R. Reimarus and concludes with Joseph Ratzinger / Benedict XVI’s ideas, a book presented by Father Alexandru Buzalic, professor at the Faculty of Theology. 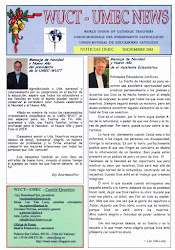 This symposium opens the wish for next year's conference, but also for the one organized by UMEC/WUCT, the World Catholic Teachers' Encounter in November, which will occur in the Oradean Seminar. Il XII Simposio Internazionale "Scuola di Transilvania", organizzato dalla Facoltà di Teologia Greco-Cattolica di Oradea, si è svolto dall’11 al 14 ottobre nella città di Crişul Repede. Vi hanno partecipato docenti provenienti non solo dalla Romania, ma anche da varie parti dell’Europa. 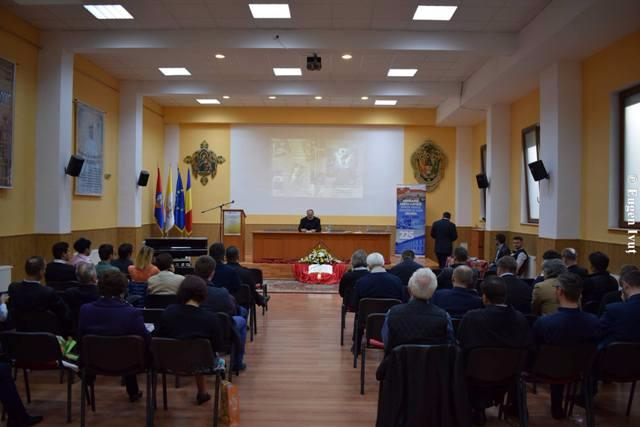 Il simposio è stato occasione per celebrare i 225 anni del Seminario di Oradea. La prolusione, sul tema “Il diritto e la persona”, è stata svolta dal Cardinale Francesco Coccopalmerio, presidente del Pontificio Consiglio per i testi legislativi. La prolusione è stata seguita anche dai professori e dagli alunni del Liceo Greco-Cattolico di Oradea.Il vescovo greco-cattolico di Oradea, monsignor Virgil Bercea ha rivolto un saluto, ringraziando i partecipanti e augurando buon lavoro. 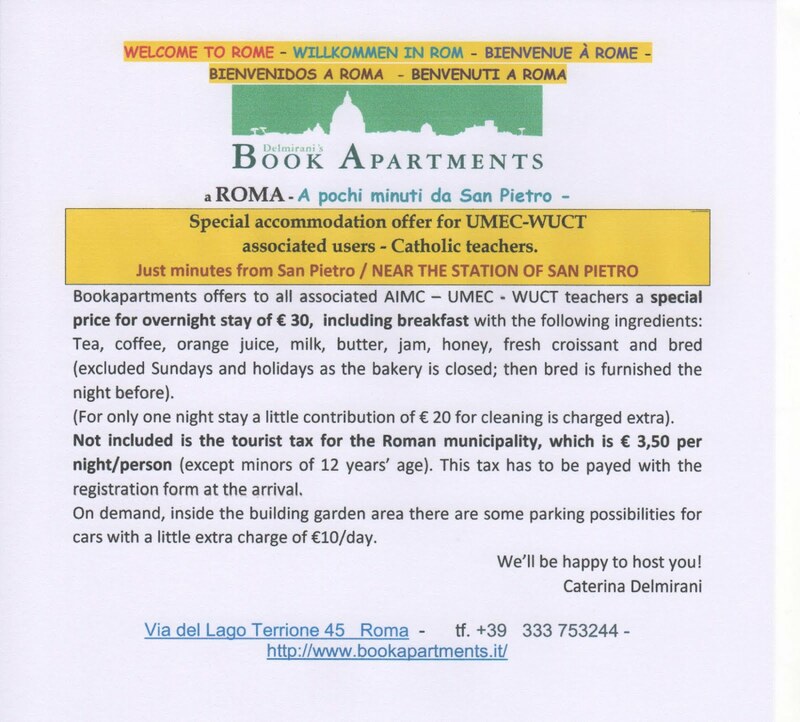 ”Sono molto lieto che questo simposio si svolge in Oradea - ha dichiarato il vescovo – E’ un incontro di alto valore intelettuale e spirituale per i nostri professori e studenti". 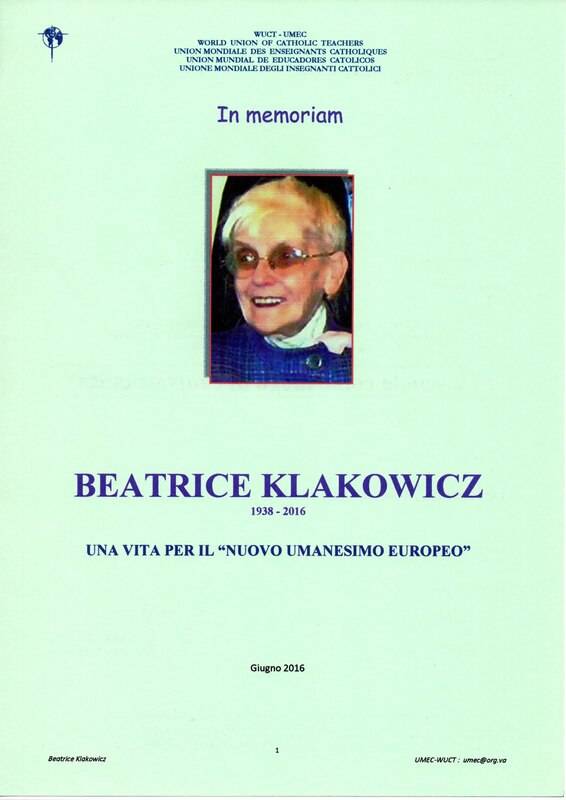 Nei giorni seguenti sono seguiti gli interventi, riguardanti la teologia, la storia della Chiesa e l’educazione di vari relatori e partecipanti provenienti da Italia, Polonia, Spagna, Slovacchia, Ucraina, Ungheria e Romania. 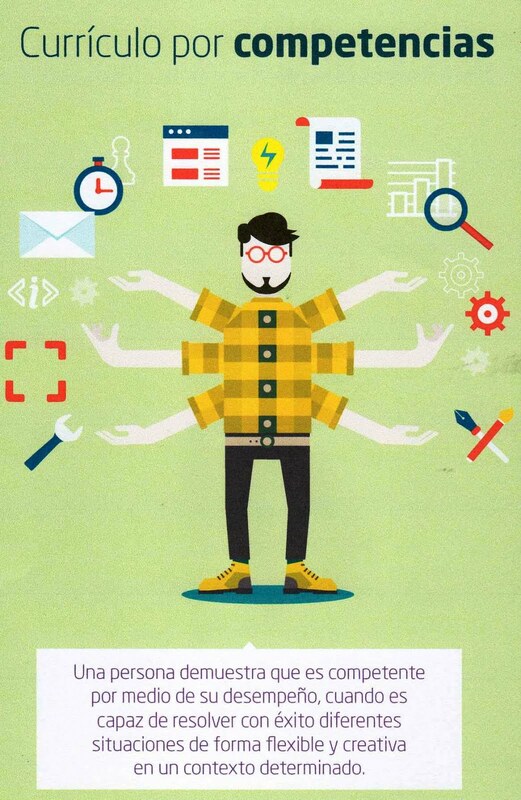 Durante i lavori sono state presentate varie pubblicazioni. Tra questi il libro di padre Cristian Sabau sulla ricerca di Gesù storico, uno studio che parte da R. S. Reimarus e si conclude con le idee di Joseph Ratzinger / Benedetto XVI. La prestigiosa opera é stata illustrata da padre Alexandru Buzalic, professore della Facolta di Teologia. 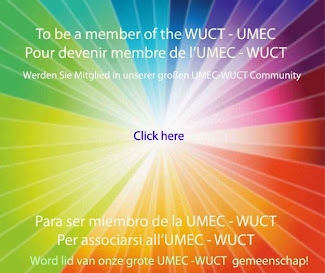 Il Simposio è stata occasione per lanciare il convegno del prossimo anno, ma anche quello che si svolgerà nel prossimo novembre, organizzato dalla UMEC/WUCT, Unione Mondiale degli Insegnanti Cattolici, che sarà ospitato dal Seminario di Oradea dal 10 al 12 novembre, sul tema “L’insegnante di fronte alle sfide dell’oggi”. I relatori proverranno dal Congo, dalle Filippine, dalla Gran Bretagna, dall’Italia e dalla Romania. VkdL: Leben Gläubige länger und gesünder?